On many fronts, the Metropolitan Opera's most recent production of Così Fan Tutte is elegant, streamlined and effective. Fiordiligi and Dorabella are Così young veterans Miah Persson and Isabel Leonard, known for their interpretation of the same roles at the 2009 Salzburg Festival, a production that has been turned into one of the most recent and popular video-recordings of Mozart's opera. Pavol Breslik (Ferrando) graced the ensemble with his gorgeous tenor voice, and Danielle De Niese as Despina was extraordinary on accounts of both her agility and bright comic flair. The stage-designs are light and practical: against a backdrop of open seas and sky, a cross section of a house, a garden patio, a few quivering trees, a far away ship and a large wall of wooden venetian blinds act as moveable sets. The set changes are a time for wit and inventiveness: Despina—the pesky maid and loveable schemer—makes her entrance grudgingly dragging a movable set consisting of her mistresses' lodgings. 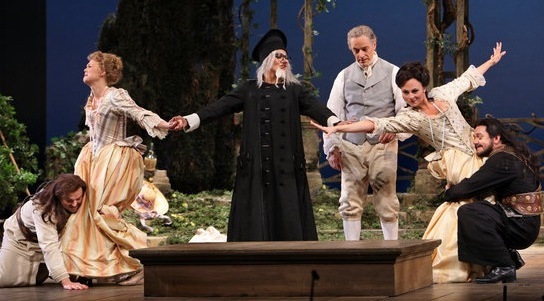 A remarkable feature of this production is that stage director Robin Guarino did not allow the lyric enchantment of the many vocal quartets in the score to arrest the dramatic flow. A case in point was the parting scene in Act I ('Di scrivermi ogni giorno'). While the two women voice their despair at the imminent parting, Don Alfonso removes sand from his shoe and twiddles his thumbs, ostentatiously bored and impatient with the lovers' cooing and wooing. This jarring juxtaposition of exquisite beauty and comic stage action created a formidable dramatic conflict for the audience, who were trapped between the emotional swell of the lovers' goodbyes and the comic relief of Don Alfonso's debunking cynicism. A sticking point, however, came with the musical delivery of ensemble pieces, which are so very crucial to Così and to Mozart's operatic output in general. The four voices of the four lovers were well-matched in timbre, but the quartet's phrasing and dynamics did not necessarily work as a unit. Of course, Mozart's vocal ensembles are notoriously difficult to sing. Yet, it is especially surprising that William Christie, whose background in early music is extensive and impressive, should have had no trouble in shaping a unified vocal ensemble. Still, it is worth reminding ourselves that Così is one of the hardest operas to stage. This is because in a staged performance, musical and dramatic success do not necessarily go hand in hand. The most exquisite moments of lyricism are almost perversely set up to be undermined by bouts of merciless irony, so that dramatic time can never stop for the sake of musical emoting. And after-all, the opera's entire message concerns the inconsistency and fallibility of human sentiment and intention. After a day of heady comic intrigue, the broken love-vows and makeshift new attachments are left standing, disquieting and unresolved; the only option left is that most mysterious staple of Mozartian morality: forgiveness. To an extent, then, the opera is set up to debunk the qualities of organic unity that we normally associate with artistic success. Perhaps it is no wonder, then, that the most successful moment of the performance was Fiordiligi's aria 'Per pietà, ben mio', where the character forlornly muses on the cruel fickleness of her own mind and heart. Persson's delivery was imbued with such genuine artistry that it shamed a critic's technical nit-picking. As she communicated her audience the deep enigma that lies at the bottom of the opera's final message, it compelled the audience—and the music critic— into the profound compassion that Mozart, more than any other composer, captured in his music.